Bad breath is one of the most embarrassing social problems that people face, and eliminating can prove more difficult than most people realize. If you suffer from bad breath, Anzac Avenue Dental has the solution. Most people think that bad breath (halitosis) is caused by poor brushing. In some cases this is true, but for many people it is a sign of a problem involving bacteria that collects at the back of the tongue, between the teeth and under the gums. It can also be link to certain illnesses or medications. Normal brushing alone doesn't always remove the bacteria and the end result is intermittent or ongoing bad breath. The first step to eliminating bad breath is to have a regular examination and clean to ensure that your teeth and gums are healthy. Once this has been achieved, you can use CloSYS II to eliminate the bacteria that causes the bad breath. 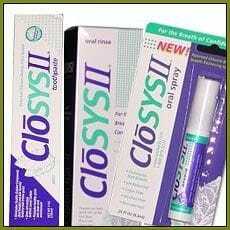 CloSYS II actually kills the bacteria instead of just masking the smell with mouth rinses or chewing gums. The impressive feature is that the effect lasts for up to 12 hours, so a morning mouth rinse is effective for most of the day. If you suffer from bad breath and you want a real solution, give Anzac Avenue Dental a call and make an appointment, or call in to purchase the CloSYS II products.